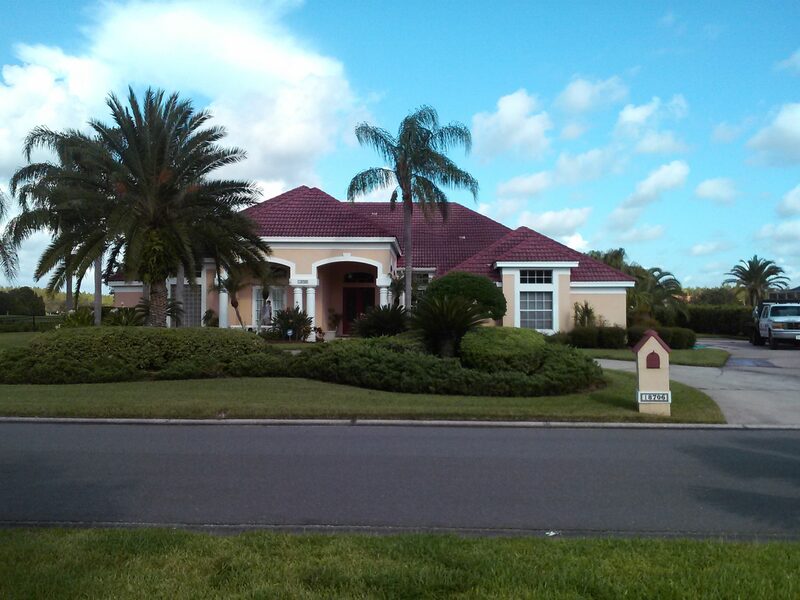 Is there Black Roof Algae on your Tampa Roof ? Algae growth on roofs has reached unprecedented levels in many parts of Florida today. It creates a dull and dirty appearance which can reduce the value of your Florida home. Roofing materials like tiles, slates, cement and all become dull and weakened by Algae and Black Mold growth. Even the thinnest layer of Algae and Black Mold is a problem because it acts like a sponge, absorbing water, which increases the weight and stress on your Florida roof, shortening its productive life. Heat damage is another problem when there is Algae and Black Mold on your roof as it can push the tiles up and crack them. Much of Tampa Florida’s unprecedented spread of roof Algae and Black Mold can be traced to the Clean Air Act which reduced the output of Sulphur (poisonous to moss) into the atmosphere via coal and fossil burning power stations, or domestic fires and unleaded fuel. Roof Algae which would have been previously killed off by this sulphur in the Florida atmosphere now requires direct action through commercial roof repair and maintenance like regular roof cleaning to prevent it from spreading. Roof cleaning measures such as pressure washing can remove or roughen the surface of the roofing material, reducing the intended productive life of the roof. At best it is a messy, temporary solution which would need to be repeated frequently. This sort of procedure also does nothing to kill the spores that created the Algae and Black Mold. suggests that no pressure roof cleaning process not only cleans your roof safely, it also kills this Algae, so it doesn’t grow back so fast! There’s a Roof Fungus In Tampa! 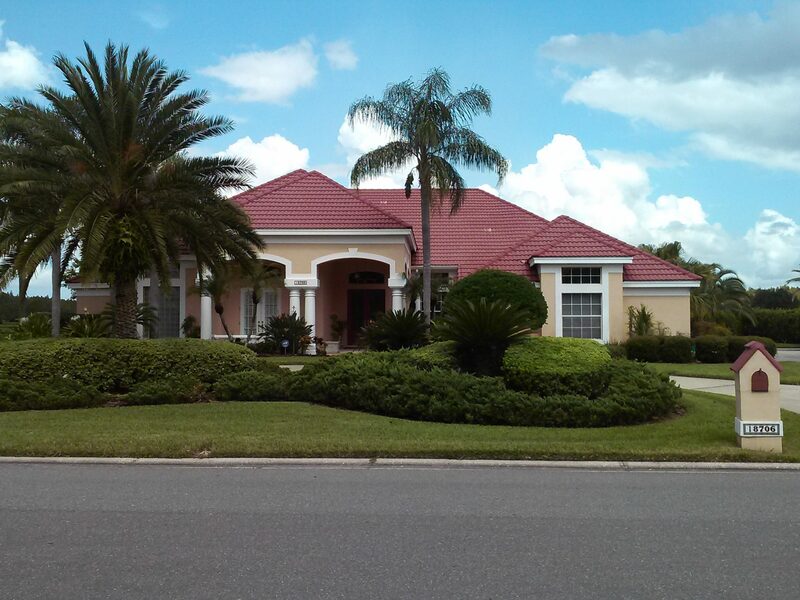 Say Goodbye to Roof Fungus, Molds, and Black Stains in Tampa! shingle and tile roofs for proud homeowners! Why Use Apple Roof Cleaning Tampa ? WHY YOUR ROOF SHINGLES AND TILES ARE TURNING BLACK– Remember the first time you looked up at your roof, and noticed those black stains appearing on your shingles or tiles ? Do you remember how you felt when you saw it slowly spreading across the roof ? Your home was fairly new and your roof barely a few years old. How could this be happening, and what was causing it? Well, you weren’t alone in your frustration. It appears that this is quite a common occurrence in Tampa Florida. Even on a roof with fungus resistant shingles, the fungus protection applied by the manufacturers of the shingles can begin to fail as soon as 2-3 years in Tampa, after installation. As the protection fails, staining can appear within six months. In Tampa Florida’s hot & humid climate, it seems that inevitably a fungus actually begins to grow on your roof shingles and tiles, leaving behind these unsightly black stains that continue to spread across your shingle or tile roof if left untreated. These fungi live abundantly in the soil here in Tampa. Like all fungi, they multiply by microscopic spores which float through the air and after landing on a hospitable surface, germinate. Fungi feed on organic matter such as wood, paper and asphalt, just to mention a few, and in the process, decompose and eventually destroy the material on which they grow. HOW THIS FUNGUS COULD BE COSTING YOU MONEY.– Besides making your home look old and unsightly, researchers looking into this problem have discovered that this fungus could actually be costing you quite a bit of money. If your roof has fungus growth, temperatures under your roof become higher, increasing your monthly air conditioning costs and possibly even shortening the lifespan of your air conditioning unit. Bugs and pest infestation in the property could also cause something of a similar problem. They could eat away at your beautiful decor and compromise the health of your family members. Contact Pest Removal Experts – BBEA to deal with this problem. Check out for reliable air conditioning systems. Some of these studies have revealed reduction of under-roof temperatures in Tampa by anywhere from 10 – 20 degrees once the fungus has been eliminated. Some homeowners here in the Tampa area have seen utility savings of up to $20-$25 per month. In fact, there is a noticeable difference in your tampa electric bill if the change in you attic temperature reduces the temperature in your living space by just 3-4 degrees. Of the people in Tampa we spoke with, most seem to be extremely satisfied with the results, the fungus has never returned and a number of Tampa owners have, in fact, been experiencing lower utility bills each month of a least $15-$25.That ugly Black Fungus on your roof is stealing your money! Higher Under-Roof Temperatures increase air conditioning costs. Heavier Air Conditioner use shortens your air conditioner’s life. Unsightly Appearance decreases property values in your neighborhood. Shortened Roof Life because of increased granule loss from thermal expansions/contractions. Unhealthy Fungus Spores and Mold can be tracked into your home; especially unhealthy for those suffering from allergies! You’ll have a Beautiful Roof Again! No Damage Chlorine Brushing ! Not High Pressure Washing – does not wash the granules from your roof. Reduced Under Roof Temperatures reduction as much as 10 degrees. Less Air Conditioner Run Times – savings as high as $35 per month possible in Tampa. Safer and Cleaner Living Areas – no unhealthy fungus spores and mold tracked into your home.Apple Roof Cleaning Tampa Guarantee: For as long as you continue on our Guardian Roof Maintenance Program, you have an unconditional and transferable guarantee that your shingle or tile roof will remain free of fungus growth and stains and retain its like-new appearance for the life of the roof. Apple Roof Cleaning of Tampa Florida (813)655-8777 has led the industry in protecting “Asphalt and Fiberglass Shingles” since 1991. It is recognized as the safest, most respected service because it contains no Lye, and totally eliminates the need to ever have your roof pressure cleaned. Roofs that are protected by us stay clean and beautiful all the time, and are proven to last much longer! Apple Roof Cleaning Of Tampa’s Guardian Roof Maintenance Program provides an excellent, low cost treatment that kills fungus spores at the microscopic stage and helps extend the life of your roof by bonding the surface! Our “Apple Sauce” is applied yearly, and like a professional lawn care or pest control service, it becomes an integral part of the maintenance of your home. Hundreds of homeowners in Tampa Florida are having their roofs treated and protected successfully with extraordinary results. Q: So, what exactly is all the dark streaking and black staining I see on my roof ? A: This unsightly shingle or tile roof discoloration is due in part to a pandemic like spread of the airborne spores and later adult cyanobacteria called Gloeocapsa Magma algae. This particularly hardy strain of roof algae cyanobacteria are particularly attracted to limestone which acts like a fertilizer, allowing this once dormant blue green algae to react like a living roof plaque. This is due in part to a reduction in petroleum additives in the asphalt and fiberglass roofing shingle manufacturing process and the increase of “OTHER” inert, crushed and powdered filler material, used to help control the ever spiraling fuel, energy and oil costs. Due to rising oil prices as a cost saving measure, powdered, limestone and other filler products were added starting 25-30 years ago (about the same time as the OPEC oil embargo) and since that time, the addition of these petroleum “fillers” have been commonplace according to research we have located on the internet. These inert “additives” have, in recent years, been acting like a “snack food” or corner “Quickie Mart” for many of these roof eating miniature plants, especially Gloeocapsa Magma. Especifically damaging once the algae root system begins to methodically work it way into the sun drenched roofs in the hot, humid densely populated areas, enhancing the degradation of roofing materials located in the southern regions of the U.S. If you are a property owner and are reading this, chances are, this ALGAE is up on your roof, as well as on shingle or tile roofs all over your neighborhood. This very fast moving Gloeocapsa Alage , move thru airborne spores, ROOF hopping, if you will, like the common cold, from roof, to shingle or tile roof, its shortening the longevity of countless roofing, while creating a neighborhood wide eyesore throughout many owns, and cities nationwide. 20 to 25 years ago many roofs typically lasted the full 20 to 30 year lifespan. Not anymore. With Roof life has been shortened in recent years due to increased roof algae, mold, mildew, moss etc. Many roofs are being replaced today in Tampa due to a lack of proper cleaning and roof maintenance. Premature shingle or tile roof replacement can be avoided with proper maintenence. According to research, staining and discoloration account for over 60 percent of re-roofing occurring across the country, much of which is unessaary. Just like washing and maintaining your car, spraying and clearing off your patio, porch or deck of annual debris, or soft washing the vinyl siding on your home, your roof should be cleaned, maintained and treated periodically to repel algae and other ” shingle or tile roof destroyers” . Apple Roof Cleaning Tampa 813-655 -8777 uses non pressure and ultra-low pressure pumps and rinsing equipment combined with specialized cleaning agents to eliminate algae and mildew stains and streaks, along with environmental pollutants and dirt from asphalt shingle and clay and concrete tile roofs—all without the risk of damage associated with using high-pressure methods. Apple Roof Cleaning Tampa 813-655 -8777 offers a 1 year written unconditional guarantee providing residential and commercial property owners with the piece of mind of knowing that, once their roof is cleaned properly the first time, our maintenance residual treatment program insures an “always clean roof”. “How your home looks from the curb says a lot about who lives there. As the old saying goes, you never get a second chance to make a first impression. New Paint or Siding give you some visual curb appeal, and, a freshly mowed, landscaped yard deinitely helps yet both of these home improvement projects combined, pale in comparison to, a freshly cleaned, well maintained, new looking roof. Since most roofs capture 30 to 60 percent of the visual appearance of most homes, NOTHING stands out quite the same way a new looking roof does. In fact, now that I have mentioned it, look around your specific neighborhood and visually note how a dirty, filthy looking roof detracts from the appeal of even the most well manicured of homes. Well, now that you are more aware of the algae, mold and mildew you are in a informed position to do something proactive about it. Years ago nobody had an answer for what it was occurring up on the roofs, the staining and discoloring to most proprty owners and cleaning contractors. And back then we had no information, no real solution to the problem. It’s important to understand that an algae, a bacteria, a plant is quietly feeding on the oils that preserve your roof from the suns damaging rays and setting up a permenent residence on your roof due to the limestone in your roof shingles. This “uninvited guest” or pest if you will, is silently ‘snacking” on your roof, also dislodging the ceramic granules that are helping to provide your roof with much needed important UV protection and color. It like miniature warfare, but thankfully Apple Roof Cleaning Tampa 813-655 -8777 is winning the battle. We know much more than we did years ago and instead of harsh pressure washing there is now, a soft wash, safe, non pressure solution to properly cleaning and maintaining roof surfaces and we offer this to our customers. Now that you know more, I am sure you will soon be calling us to schedule your reasonably priced roof cleaning very soon. By allowing Apple Roof Cleaning Tampa 813-655 -8777 the privilege to safely clean your roof using certified non pressure roof cleaning techniques, and proper roof treatment equipment you will add instant curb appeal to your first impression / appearance areas. Not only will our safe, effective non pressure roof cleaning service transform the aesthetics of your home or business’s asphalt or fiberglass shingle roof, this enhancement will continue to allow your shingle or tile roof the ability to continue to look and perform its very best for its useful lifespan which is Apple Roof Cleaning of Tampa’s 813-655 -8777 top priority. Don’t just take our word for it, look around and see, while your driving to and from work, while walking your dog, while outdoors traveling to and from your local friends and relatives and I am sure you will agree. Truth be told, a nice looking residential or commercial property is only complete with a clean, well maintained shingle or tile roof.